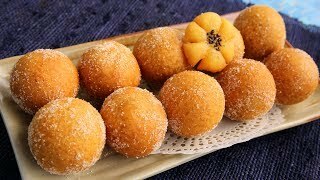 Today’s recipe is one of the most popular Korean snacks, chapssal doughnuts. They’re a modern Korean treat combining traditional Korean rice cakes with Western style deep fried doughnut balls. On the outside the dough is crispy and chewy, and on the inside there’s soft, lightly sweet red bean paste. You can find them in many Korean bakeries among the other sweet and savory treats. They’re not hard to make, but the red bean filling takes time and effort to get right. I did many experiments to come up with the best method to make the most delicious and less sweet chapssal doughnuts that have the best chewy-crispy texture. They’re really unique! Enjoy the recipe and let me know if you try it! Combine glutinous rice flour, flour, salt, baking soda, and melted butter in a large bowl. Add hot water and mix with a wooden spoon for 1 minute. Form it into a lump as it gathers together. Knead the lump by hand for 2 minutes, until smooth. Put it in a plastic bag to keep it from drying out. Wash the azuki beans in cold water and strain. Put them into a solid, heavy-bottomed pot. Add 7 cups of water. Cover and boil for 30 minutes over medium high heat. Turn off the heat and let the beans soak in the hot water for 30 minutes. Turn on the heat to medium and cook for 1 hour until the beans are very soft. Remove from the heat and mash the beans with a wooden spoon or potato masher. Add 3 cups of water and stir into a watery paste. Set a strong mesh strainer over a large bowl and strain the paste through it to remove the bean skins. Use your hands to squeeze every drop out of the skins as best you can. Discard the empty skins and wash the strainer to use it again. Put the strainer over an empty bowl and line it with a clean cotton cloth. Strain the paste by pouring it through the cloth and strainer. Lift up the edges of the cloth and gently squeeze it to force the all water through. When all the water has passed, you’ll be left with a solid lump of finely ground, cooked beans inside the cloth. Put it into the pot, and turn the on heat to medium high. Add sugar, rice syrup, salt, and vanilla extract. Stir well with a wooden spoon for about 6 to 7 minutes until the bean paste moves together as a lump. Remove from the heat and let cool. Use about 200 grams (7 ounces) of the red bean paste for this recipe and freeze rest for another day. Divide the paste into 10 pieces and roll each piece into a smooth ball. Cover with plastic wrap so they don’t dry out while you work. Divide the dough into 10 pieces (each one about 1 ounce, or 28 grams) and roll each piece into a smooth ball. Cover with plastic wrap. Put one of the dough balls on the cutting board and flatten it out with your hand into a disk about 2½ inches in diameter. Make a circle with your thumb and forefinger and put the disk on top of it. With your other hand put one red bean paste ball in the center of the disk and push and pull the dough around it, so the red bean ball is completely covered by the dough. Seal the dough gently and tightly around the red bean, and softly roll the ball on your cutting board to smooth out any lumps. Repeat this with the rest of the dough and red beans to make 10 balls. I usually use my 7 inch stainless steel sauce pan with 3 cups of oil and fry 5 balls at a time to save on oil, but you can use more oil and fry them all at once in a larger pan if you want. Heat up vegetable oil in a deep pan to 300°F (150°C). Fry the balls for 6 to 7 minutes over medium low heat, until light golden brown. As they fry, stir gently with a wooden spoon so they’re cooked evenly and don’t stick to the bottom of the pot. Strain and let them cool for 1 minute. Roll in sugar to coat, and serve. Finish in several hours, for the best chewiness! Posted on Thursday, July 6th, 2017 at 1:10 pm. Last updated on July 7, 2017. Posted April 14th, 2019 at 12:28 pm | Log in to reply. Posted February 24th, 2019 at 12:21 pm | Log in to reply. Hello, I have made this twice already, your recipe is very good. Do you have suggestions on how I can make the donut hollow since sometime I just want to eat the outside without the beans? Posted March 7th, 2019 at 2:02 pm | Log in to reply. I just made this recipe, stuffing it with 1-2 walnut halves with/without sugar and or nutella. And it does puff up pretty well as opposed to the non-stuffed version. I think you can stuff it with anything and it will puff. There needs to be something in there to create a stable pocket for air. Posted July 24th, 2018 at 9:08 pm | Log in to reply. Hello~ I tried out the recipe and while it was frying they started to explode. Do you know why that is? Posted March 7th, 2019 at 2:04 pm | Log in to reply. Your oil was probably too hot and/or your balls were not sealed properly. Posted July 13th, 2018 at 3:57 am | Log in to reply. I love everything about what you do, this is truly amazing. This is so crazy, i remember watching your videos back then when i was just a kid, maybe 15yrs old or so, and i became immediatly a big fan :) haha i remember begging my parents to make the tea « sew jung gwa » or something, with the dried persimmons. It never happened though, mostly because those persimmons were not available in our area. But here i am, 25, making these doughnuts, which is officially my first ever attempt at Korean Cuisine. Turned out great! Can’t wait to try more! Posted July 19th, 2018 at 8:14 am | Log in to reply. At the age of 15 you couldn’t make it, but you were so interested in Korean good, you even asked your mom to make it for you. So definitely you will be good at Korean cooking, because you were so interested in food and now you are ready to cook. Happy cooking! Posted July 31st, 2017 at 4:40 pm | Log in to reply. May I ask why you changed your recipe for the red bean paste from adding three cups of water to seven cups and from keeping the skins to discarding it? I tried out both recipes and for me the first one (with skins) tasted somehow better although I understand that for making patisserie the very smooth paste without skins should be first choice. Anyway – here is a photograph of our team work… Many, many admiring greetings from Germany. Posted August 7th, 2017 at 11:35 am | Log in to reply. I love the photo! You worked so hard to describe what you did in one photo! : ) The doughnuts look very pretty and well made. Regarding your question about the red bean paste, I prefer the soft and smooth texture of the sweet red bean paste rather than a little rough and coarse paste. It’s up to your decision which way you would want it to taste like. Posted July 26th, 2017 at 10:04 am | Log in to reply. Hello Maangchi – is it possible to buy red bean paste and make these? I plan to make it with a friend but we don’t have so much time :( Thank you! Posted July 14th, 2017 at 6:05 pm | Log in to reply. The whole family is enjoying your wonderful videos along with my attempts at some of your recipes. You are so instructive and I really appreciate that you show your method several times in a video to give us the chance to really absorb it. PS. I hope your Tee is JUST a shirt, and you are not wearing it because trolls have found you. You are wonderful. Posted July 20th, 2017 at 2:05 pm | Log in to reply. Posted July 12th, 2017 at 2:16 am | Log in to reply. Hi, Maangchi! I can’t eat gluten, and these are *so* close to being gluten-free. Do you know if I could make them using another flour instead of the 1 Tbsp. of wheat flour? Thanks in case! Posted April 4th, 2019 at 6:24 pm | Log in to reply. Corn starch would probably work! Posted July 11th, 2017 at 4:40 pm | Log in to reply. Posted July 9th, 2017 at 2:16 am | Log in to reply. Posted July 11th, 2017 at 1:07 am | Log in to reply. I’m so impressed with your cooking skill! All the balls look perfect! This recipe was originally posted on July 6, 2017 at 1:10 pm by Maangchi. It was last updated on July 7, 2017. The video was watched 1,223,595 times on YouTube & has 26,574 likes!